Not much of a Flats Gal? This little jewel will absolutely convert you forever. Really. As soon as you try this shoe on, you will want to own it in all 3 colors. It’s the cutest shoe on the foot with peekaboo toes and back side vents with a little outside bow. 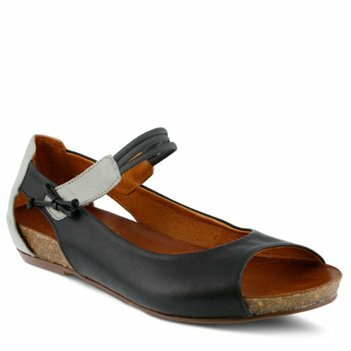 It has a contoured leather footbed on a cork midsole so its' got 'to die for' comfort. And the color combinations! Who thinks of these fabulous pairings? Spring Step! That's who! The buttery soft red/camel and the camel/olive combos have a trio of neutral stretch maryjane-ish straps that fit smoothly and comfortably over the top of your foot. Black and grey- but of course!